In an earlier posting CEMETERY FIELD TRIP Shawnna and I were wondering why Ella did not have a death date. Shawnna jokingly said "Maybe she's still alive." After looking at all the dates it seems to be that Ella was the last of the siblings to die, perhaps there was no money to add the date, or they just did not get around to doing it. I belong to the ALLEGHENY COUNTY PA Roots Web Group and they have given me a lot of help and ideas. My next step will be finding Church records. They were Lutheran so maybe I will be able to find some information. My next step will be to go to the UNIONDALE CEMETERY and take pictures and records there. I am glad the weather is warm because if it was snowing I would postpone it to the summer. How many backups does a person need? I was reading an article on CNET about the life of your external hard drive. I have an external hard drive and it has a lot of pictures and music stored on iTunes, as well as a lot of genealogical data. I also have things stored on CD's and a Flash Drives. Is that enough. Do I need to print and store things on paper as well? Most of my things can be reproduced but it may take a long time to redownload things from Ancestry and Footnote. I had stored a lot of emails on my computer only to have the hard drive fail. I had never copied them and now I store them on the ISP site. What does everyone else do, how do you store your found information. I could make paper copies but will they get pitched after I am gone? How long do CD's last, and how long do Flash Drives last? Who is the guy in the picture below? I had no idea who he was.....until I heard from a man who was researching the Sperl line. It seems that his relative (Barbara Sperl) was the sister of my husbands great grandfather (Anton Sperl). 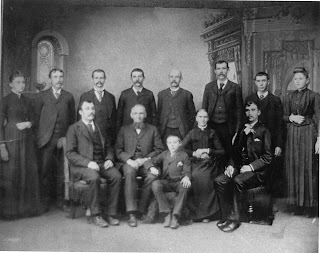 It was not till he mentioned a Sperl Family photo at a recent reunion. Look at the old guy seated in the chair. My theory is that is Christof Sperl and seated beside him is his wife Margareth Buchl. They emigrated with their two children Anton, and Barbara in 1869. They had two children in the USA one being Thomas and the other a daughter Margaret. The photo was sent to me by Patty Pschirer, who would be descendant of Barbara Sperl-Pschirer line. What do you think about the resemblance? This is a picture of the Unknown Soldier to me. His picture was in my fathers family photo album. I know it is circa World War I. Of course, as usual, there is nothing on the back. This is the wedding picture of my mother Gerda Schridde and my dad Thomas Dowd before he shipped out to Europe. It was taken Feb 1943. This is a picture of my dads brother Richard Dowd,he also was in WWI. I do not know where he was stationed. He died in 1951-1952. After Tuesdays trek to the Mckeesport Versailles Cemetery I researched some of the names on Ancestry.com. What I found was the 1920 census with Charles Dietrich, age 57, living in Duquesne PA. Also in the household was his wife, Alwine age 45, and William Bartels, age 57. William was listed as brother-in-law. Charles and Alwine immigrated in 1888 from Germany. As of the date (1920) they were all naturalized citizens. As for Ella and Minna Bartels, I found a listing in 1907 with Minna listed as a "non resident alien" (on the immigration list) with a note as sister of Mrs. Schwab. I guess you had to have a sponsor? Emma and Herman Schwab were also buried in the cemetery plot. I found Ella Bartels living in Pittsburgh in the 1920 census, with her occupation listed as a servant and he age was forty. Ella immigrated in 1904 from Prussia. On her immigration form is states sister-in-law of Charles Dietrich. Ella was from Celle, Germany which is where my grandmother Anna Bartels was born in 1900. Were William, Minna, Ella, Emma. Alwine and my great grandfather Daniel Bartels siblings? With the dates of death listed in the 1940's and 1950's why am I not able to find them for all years in the US Census? More research to be done....I guess it is never ending. My mother had mentioned that her fathers sisters had died at an early age of cancer. Maybe she said or meant her maternal grandfather sisters. Ella and Nina both died of cancer???????? My husband had mentioned that his father Joseph Sperl would go to Uniondale Cemetery and place flowers on the graves of relatives. He thought they were relatives on his dads, mothers (Mary Stephens Sperl) side. Is there a word for relatives on your fathers mother side? I did a search and there is a link for the Civil War Burials on this Roots Web Site. John and Robert Stephens are listed. 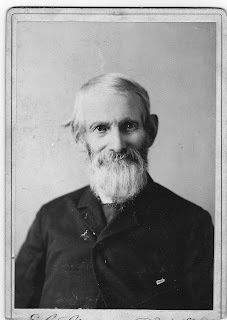 John was born 4 October 1834 and died 22 April 1912. Robert did not have a listing for his birth but died on 22 Mach 1913. By the dates I my theory is that one of these men were Mary Stephens Sperl grandfathers. Mary was born in 1900, I have not done much research on her line because I never had much information. Now I can proceed with research on her line. Chuck and I will be going there this summer some time. I need to go when the office is open, so that eliminates weekends. Shawnna and I went on a field trip to the McKeesport Versailles Cemetery. I found the graves of my grandparents, actually I knew they were there. I had been there long ago with my parents when the tended to the graves. What I had recently found was my grandmothers brother. His name was August Bartels. What I did not expect to find was two more Bartels, Minna and Ella. Ella died in 1955. From the years of their births, could they be August and Anna’s aunts. The sisters of my great grandfather. I perused Ancestry but did not find anything on first look. I also found two graves of Charles Dietrich and his wife Alwine, and two graves of Herman Schwab and Emma Schwab. I remember my mother talked of Schwab’s as cousins. It seemed at some time they lived in Birmingham AL, Herman was working at the steel mills there. I reading Randy Seavers Blog about what inspired you to start with Genealogy. About twenty years ago my cousin Helen Jean stopped to visit my mother in law and ask about her mothers recollections with Lois’s Family. Lois and Helen Jeans father were siblings. My biggest regret is not asking questions when the parents were living. I wonder what percentage of the genealogist have that some regret? I would be willing to be it would be a high percentage. A big Thank You to Alana for nominating me for The Lovely Blog Award. I haven't been doing much blogging the past few weeks. I am off for a week and next week plan to go to two cemeteries for some photographs. Although I write about my German side, I do not have photos if their tombstones. My sister said she will go with me. My brother wants to do some maintenance on the plots and I guess, possibly, we can make it a family affair. I have not posted for awhile. This picture was taken probably in 1960 or 1961. It is another of my sibs and I, along with my mother Gerda Schridde Dowd. 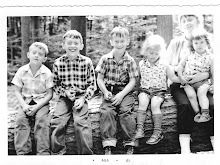 This was taken on an outing to Allegheny National Forest, my father, Thomas was the photographer. In this particular shot he did not chop off anyone’s head. I think I have that dumb teen age look. At least I wasn’t rolling my eyes….